The RIGHT Function is categorized under TEXT functionsFunctionsList of the most important Excel functions for financial analysts. This cheat sheet covers 100s of functions that are critical to know as an Excel analyst. The function will return a specified number of characters from the end of a given text string. In doing financial analysisFinancial Analyst Job DescriptionSee a real Financial Analyst Job Description including all the skills, experience, and education required to be the successful candidate for the job. Perform financial forecasting, reporting, and operational metrics tracking, analyze financial data, create financial models, the RIGHT function can be useful if we wish to extract characters from the right side of a text string. Generally, it is used by combining it with other functions such as VALUE, SUM, COUNT, DATE, DAY, etc. Text (required argument) – It is the original text string. Num_chars (optional argument) – It specifies the number of characters to be returned from the end of the given text. It is the number of characters to be extracted starting on the right side of the text. If we omit the argument, the default value of 1 is taken. 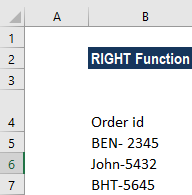 How to use the RIGHT Function in Excel? The RIGHT function always returns a text string, even though it contains digits and looks like a number. It is important if we wish to use the result of the function within other functions or formulas. Using the VALUE function, we can ensure the number format is kept and the result is not converted to text. 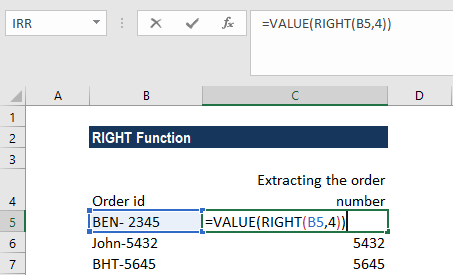 As we can see in the screenshot above, the numbers in column B obtained with a VALUE RIGHT formula are right-alighted in the cells, as opposed to left-aligned text in column A. 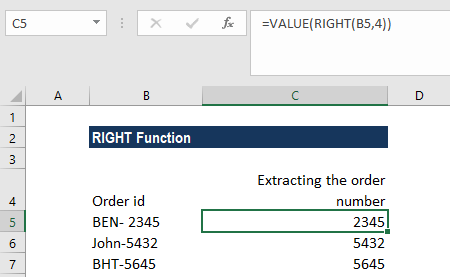 Since Excel recognizes the output as numbers, we can even sum or average the values, find the min and max value, or perform other calculations. #VALUE! error – Occurs if the given [num_chars] argument is less than 0. Dates are stored in Excel as numbers, and it is only the cell formatting that makes them appear as dates in our spreadsheet. Hence, if we attempt to use the RIGHT function on a date, it will return the start characters of the number that represents that date. For example, 01/01/1980 is represented by the number 29221, so applying the RIGHT function to a cell containing the date 01/01/1980 (and requesting that 4 characters be returned) will result in a returned value of “9221.” If we wish to use RIGHT on dates, we can combine it with the DAY, DATE, MONTH or YEAR functions. 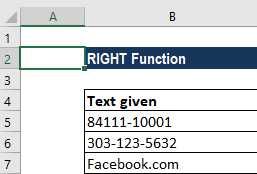 Otherwise, we can convert the cells containing dates to text using Excel’s Text to Columns tool.